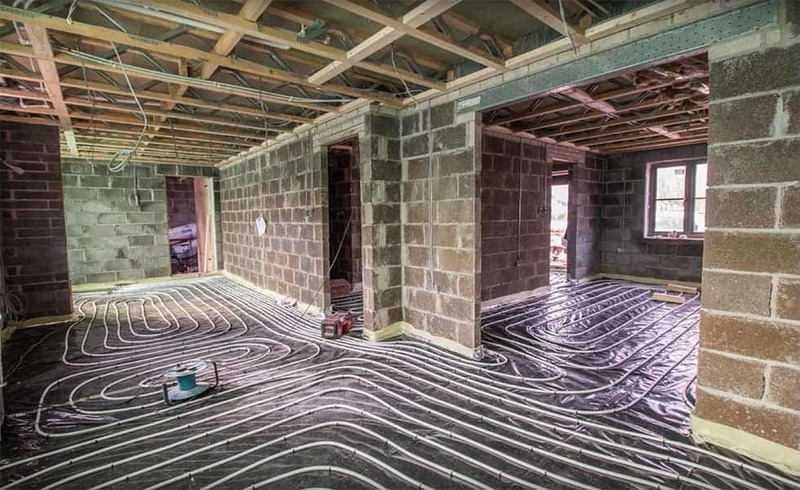 Underfloor heating is an increasingly popular choice for homeowners looking to extend or renovate existing properties, and for self builders looking to build their own homes. However, getting your underfloor heating system right requires a joined-up approach and involves the homeowner making some key decisions. 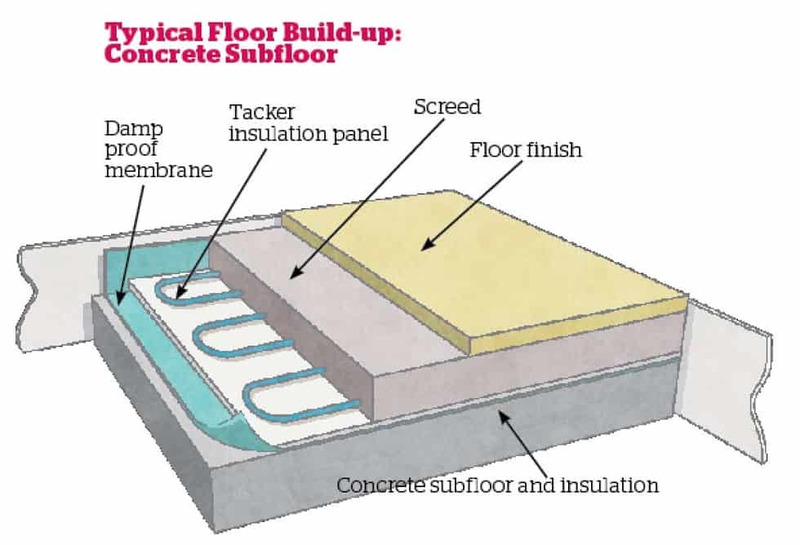 In basic terms, a wet underfloor heating system features pipes, filled by warm water and powered by a boiler or heat pump, concealed within the floor, and typically embedded within a screed. In effect, the pipes mean the whole floor acts like a radiator, warming the room from the ground up. A whole-house underfloor heating system will feature separate pipe runs to each room or ‘zone’. This provides the opportunity to control the temperature and timing of each zone to suit occupancy patterns. For example, the living room may need to be warm through the evening while bedrooms need to be heated later in the day. For the latter reason, underfloor heating works well with renewables, particularly ground source or air source heat pumps. Underfloor heating costs from around £20/m2 to £40/m2 installed. Factors such as the size of the property, the amount of heating the building needs and whether it is a new build, renovation or conversion, will impact on the cost. UFH is more expensive to install than a comparable radiator system — it typically costs 20% to 50% more. The thickness of the screed in which the warm wet pipes sit will have a dramatic impact on how the system is used. 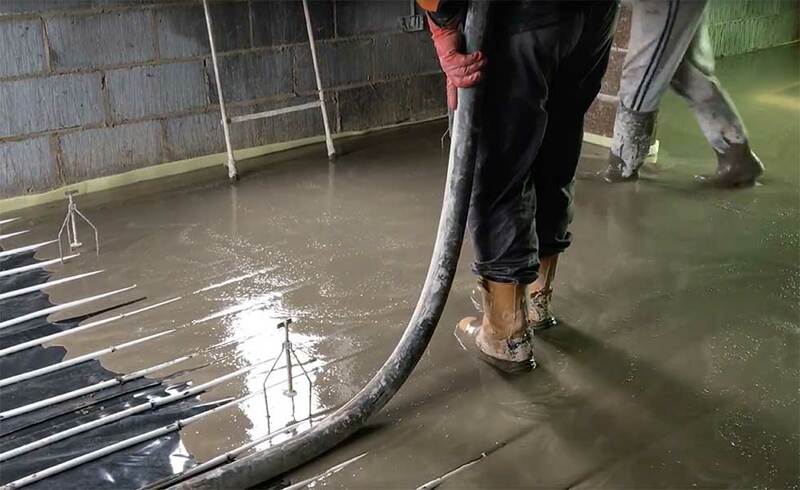 A thick screed will give a longer reaction time (the time taken to warm up and cool down), while a thin screed will have a quicker reaction time. Which is right and best will depend on the construction of the house, your occupation habits and how you intend to use the house. Which Floor Covering Should I Choose? Tiles, stone or similar are generally accepted as the optimum covering. They absorb heat rather than insulate and allow that heat to radiate into the room, but they are not the only option. Whatever floor covering is to be used, it is a good idea to tell the underfloor heating designer so that the pipe layout can be properly specified. The zone control will be placed somewhere where the homeowner can make adjustments, while the manifolds will be placed out of the way – under the stairs or in a cupboard – so as to be unobtrusive. There is no regular maintenance regime associated with underfloor heating, but if things do go wrong, it will typically be with the control systems rather than the system itself. One of the key challenges when installing UFH in existing houses is the depth of the system. Once insulation, the screed and final floor covering have been installed, the floor height may have been raised by some 150-200mm. There are low-profile systems, developed specifically for that situation, that can be installed directly onto existing floors that offer significant savings in retrofit situations. Nu-Heat’s LoPro system, for example, was developed for this situation. Nu-Heat’s LoProTM10 is an underfloor heating solution for retrofit purposes with a total build-up of just 15mm. Low-profile systems tend to have smaller diameter pipes and run at a higher temperature. The impact of this is that the floor will heat up and cool down far more quickly than conventional UFH. Where UFH is added to an existing radiator system then a different control system will be needed. Luckily wireless thermostats (some of which can be controlled with a phone app) make installation far easier. 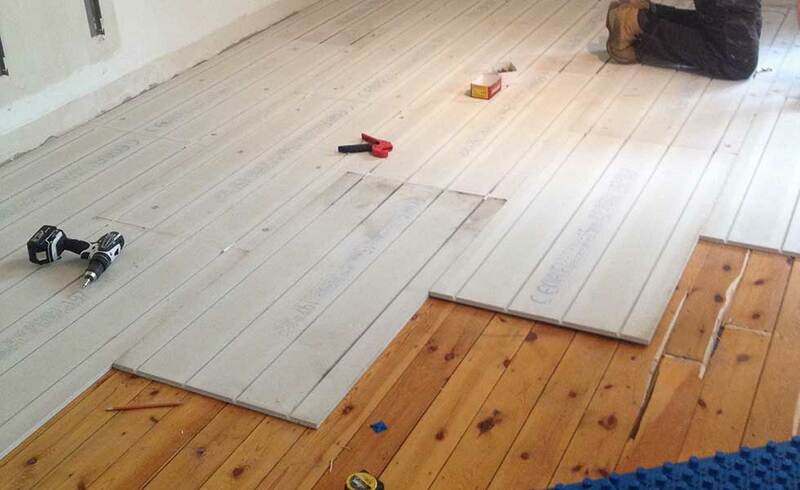 Retrofit underfloor heating system will always be a bit more expensive to install, but the cost could be a lot higher if existing timber floors need to be taken up or concrete floors excavated. Ultimately, the efficiency and success of an underfloor heating system will depend on the quality and design.Therefore, choosing a supplier who offers a good design service and aftercare is important. A specialist underfloor heating company is often best placed to achieve this. If the design is wrong it is unlikely that the homeowner will know until they have lived in the house for a whole heating season — by which time it’s probably too late. Finally, if you are choosing to pair underfloor heating with a heat pumps it is a good idea to choose one supply and install company. Both are complex systems and getting the whole heating system to work in perfect harmony can be tricky. Radiators have served us well for many years: they are cheaper to buy; they are well understood and there is a huge choice when it comes to size, style and installers. But they are less efficient and take up floor space. Perhaps the biggest problem is that in larger rooms they can produce a temperature difference of up to 4°C across the room. People want more energy-efficient houses and a system that gives a 15% reduction in energy demand (compared to a radiator system) cannot be ignored. And that is to say nothing of the greater comfort and the increased floor space that it brings. Electric underfloor heating is often cheaper and easier (particularly in existing homes) to install than wet UFH. However, the running costs can be three times higher. It is often a good idea to install electric underfloor heating in a small, single area like a bathroom or en suite, where it may be difficult to install wet underfloor heating. One of the most common – and worst – uses is in a conservatory. Typically these areas need a lot of heat and are used for relatively long periods of the day (compared to a bathroom). Then running cost becomes the key issue and the extra trouble and expense of a wet system is well worthwhile. Many of our clients, especially in the Chelsea and Kensington areas of London are moving from traditional radiators to underfloor heating. Do give us a call on 0208 191 7595 if it’s something you are considering. We can advise you on the best way forward. If you prefer, you can book a free consultation via our website, where a member of our team will visit your property, discuss your needs and share our recommendations with absolutely no obligation.